The original Tour Tub has been replaced with a double decker bus. You can begin your tour of popular places such as the Darwin Museum, Doctors Gully Fishfeeding & the Indo-Pacific Marine anywhere along the route and travel as you wish all day. Spend as much time as you like at each stopover, then rejoin the Tour Tub for your next destination when it returns on subsequent loops. Purchase tickets from the driver. $45pp full day. Children 4-12 years old $20pp. Family and group rates on application. Ticket includes 50% discount for entry to World War II Tunnels. Each tour follows the same route according to the times below. Times are subject to traffic conditions, please allow a few minutes if you are planning to catch the bus. 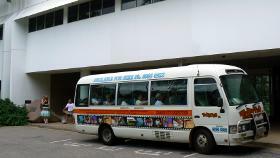 The Tour Tub has been providing tours around Darwin since 1985. This colorful vehicle is popular with all age groups and is designed to be flexible and casual, just like the Top End lifestyle. Return from Darwin Tourist Bus to Enjoy Darwin Home.